Nikita Puri visits Titan's latest offering, which brings handloom sarees under one roof. IMAGE: The idea behind Taneira, Titan's flagship apparel store, is not just to promote handloom but also to educate the urban buyer about the history of craftsmanship of the sarees. Photograph: Courtesy @taneirasarees/Facebook. Tucked behind two towering gulmohar trees, the sight of off-white khadi lamps hanging from the ceiling of a remodelled villa in Bengaluru makes one slow down almost immediately. There is no boundary wall that blocks out this villa's view from the 100-feet road in upscale Indiranagar, only a concrete panel that rises up from knee-high grass. 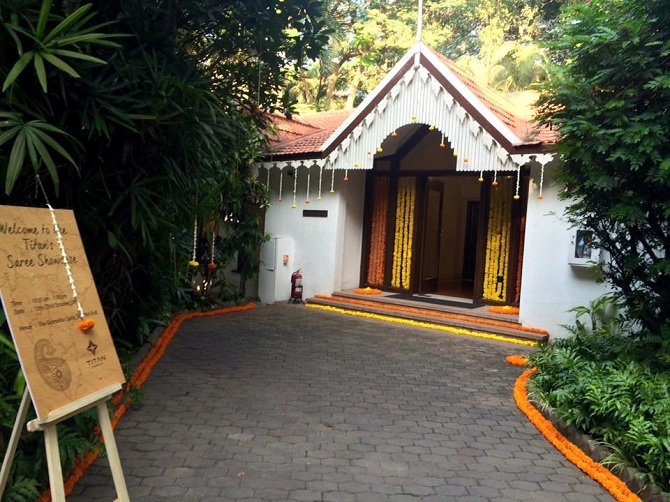 Come evening, lit candles, yellow and orange marigold installations guide visitors to the door of this villa. Once you enter, the experience becomes even more sensory: there are sarees everywhere, and these are laid out in ways that encourage one to touch and engage with the wrap and weft. The idea behind Taneira, Titan's flagship apparel store, is not just to promote handloom but also to educate the urban buyer about the history of craftsmanship of the sarees. In between the full-length mirrors and wooden shelves across the villa, there are boards that highlight histories: the section dedicated to Chanderi sarees, for instance, has sketches of the Koshak Mahal in Madhya Pradesh, the region where Chanderis were born, along with a note on the sarees detailing how cotton threads have eventually stepped in for silk ones to give a 'crisp, fresh' look. "Our journey started a little over a year ago when we went on textile trails," says Shyamala Ramanan, the business head at Taneira. "We wanted to bring to the forefront the different types of sarees available in India under one roof," she adds. Before focussing on expansion plans, Taneira will remain in pilot mode for about a year. Continue to browse through the space and one comes to the section celebrating Ikat dyeing techniques. Fabric samples hung up on the walls help differentiate between the Sambalpuri Ikat from Odisha, Pochampalli from Andhra Pradesh, and Patan Patola from Gujarat. While the cotton sarees at Taneira start at ₹2,000, the exquisite Patan Patola sarees, which take up to a year to make because each strand of the saree-to-be has to be dyed and dried separately, are priced at ₹2.5 lakh. Three of these Patan Patolas have already found new homes in the few days that Taneira has been open. From Kanjeevarams woven in Tamil Nadu to Jamdanis from West Bengal, the team at Taneira has put together a collection of over 3,000 handcrafted pieces. On board with Taneira for these handwoven sarees are 200 craftspeople from 20 states. IMAGE: The flagship Taneira showroom in Bengaluru. Before focussing on expansion plans, Taneira will remain in pilot mode for about a year. Photograph: Courtesy @taneirasarees/Facebook. "We have some unique traditional classical pieces that are perhaps made in only a few looms in the country. And we have a wide variety to cater to women with different needs for different occasions -- workwear to a simple day-time function to evening parties, festivals to bridal and wedding -- all in natural and pure silks, cotton, khadi, linen, tussar and more," says Ramanan. Sourcing quality handloom and offering a mixed line-up is one of the biggest tasks for Taneira's design team, and its search has certainly borne fruits. While the double Ikat pasapali sarees from Odisha are inspired by gambling games (Chaupar), the Eri silk sarees here celebrate the craftsmanship of Assam's Bodo tribe. Other remarkables at the store include a Banarasi silk saree: this has six lines of a Ramayana shloka woven all across it. This saree is a signature special of a Muslim family of weavers in Varanasi. Then there's also the 'mehendi racha haath' Chanderi special. Traditionally gifted to brides, there's a mehendi pattern coursing through the pallu. Some of the sarees here tell tales of their origins: like the Banarasis that have scenes from the Ganga ghat and the Ikats from Odisha that have clay pots and earthen toys, human figures and fish. What Taneira offers is a seamless transition between worlds: a few steps and you move from geometrical Ikat tie-and-dyes to a section where gold-coloured veena motifs usher you into a world of classical south Indian sensibilities. As painted wooden parrots hang from mirrors, the elephants and peacock motifs shimmer on a blue Kanjeevaram modelled here. In the backdrop of all this, fading in and out is Mozart's 25th Symphony, a tune that Titan has been associated with ever since one can remember. Oddly enough, the tune falls right in place with the classical weaves at Taneira. And even after you leave the store, memories of the colours and texture of the handlooms continue to linger on, much like Mozart's Symphony No 25. Is this the end of the road for Varanasi's handloom weavers? PIX: Indian weaves go fabulously glam! Have you heard of 'Ahimsa silk'?